The Quick-Release SLIC Pin is truly one slick pin! SLIC is an acronym for Self Locking Implanted Cotter Pin, and as the name implies, it is a pin and cotter all in one! This one-piece locking clevis pin is cost-saving, fast and secure. It functions as a quick locking pin wherever you need a quick lock function. 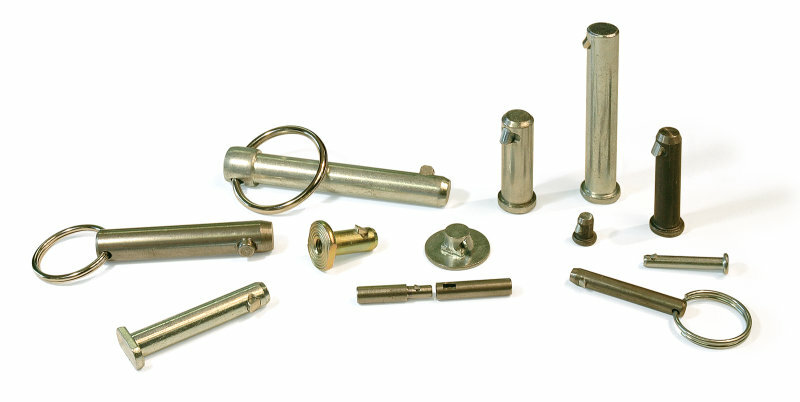 This revolutionary fastening pin is understandably highly popular and used successfully in a wide-range of applications. Quick-Release SLIC Pins feature a strong, spring-loaded plunger that functions as an easy insertion ramp. 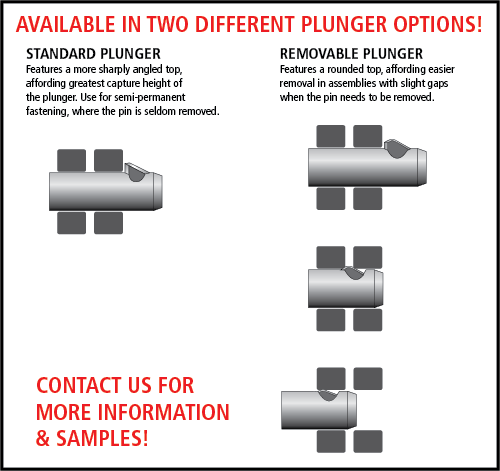 The plunger retracts when inserted, then springs back up when through the joined material. The vertical face at the rear of the plunger prevents backing out and locks the pin into place! This patented design is ideal for limited-space applications where cotter pin or retaining clip access is limited. Contact us for free samples to try! Made to your specifications including special plunger shapes, different pin or head styles, various finishes and different pin materials. The SLIC Pin is truly one slick pin! SLIC is an acronym for Self Locking Implanted Cotter Pin, and as the name implies, it is a pin and cotter all in one! This one-piece locking clevis pin is cost-saving, fast and secure. It functions as a quick locking pin wherever you need a quick lock function. This revolutionary fastening pin is understandably highly popular and used successfully in a wide-range of applications. 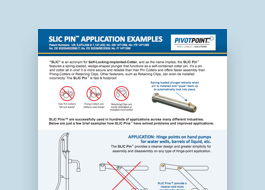 SLIC Pins feature a strong, spring-loaded plunger that functions as an easy insertion ramp. The plunger retracts when inserted, then springs back up when through the joined material. The vertical face at the rear of the plunger prevents backing out and locks the pin into place! This patented design is ideal for limited-space applications where cotter pin or retaining clip access is limited. SLIC Pins, one piece locking clevis pins, eliminate cotters, bolts and nuts and clips; and do not require tools for use- thereby greatly speeding assembly times! These quick locking pins are well suited for automated assembly; and are easier, safer and faster than standard clevis pins, cotter pins and clips. Whether you choose to call it a SLIC Pin or a slick pin, we’re sure you’ll love it. CONTACT US FOR FREE SAMPLES TO TRY!